John was born in Chicago, Illinois, in 1949. He graduated from Iowa State University in 1971, and Drake University Law School in 1974. At Drake he was a member of the Phi Alpha Delta Fraternity, Order of the Coif, Order of Barristers, and the Drake Law Review 1972-1974. He is licensed to practice in Iowa, United States District Courts (Northern District of Iowa), Eighth Circuit Court of Appeals and the United States Tax Court. 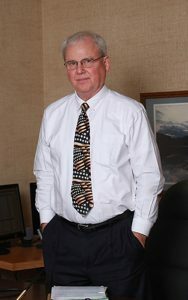 He is a member of the Cherokee County, Iowa State and American Bar Associations, and the Iowa Association for Justice.